Confluent has announced changes to the license for some components of their Confluent Platform, a streaming platform which provides capabilities to transport data, and tools to connect systems and data sources. The license changes specifically focus on restricting the usage of these components by SaaS providers. Founded by the creators of Apache Kafka, Confluent employees are still among the primary committers on the project, while also providing their own platform based on this. 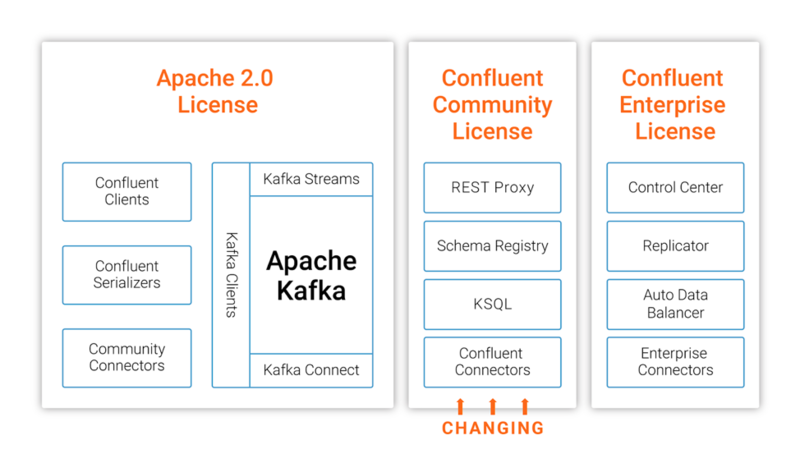 The license changes will only impact specific components of this Confluent Platform, and "has no effect on Apache Kafka, which is developed as part of the Apache Software Foundation and remains under the Apache 2.0 license", as stated by Jay Kreps, co-founder and CEO of Confluent. Accordingly, the components restricted by the new license are the Confluent REST Proxy, Schema Registry, KSQL, and connectors and were formerly known as Confluent Open Source. These license changes closely follow the announcement of Amazon's Managed Streaming for Kafka, and seem to have been created to restrict cloud vendors like Amazon, Microsoft, Alibaba, and Google in competing with the capabilities provided by Confluent. Notably, the specific passage of the license states this as follows. Licensee is not granted the right to, and Licensee shall not, exercise the License for an Excluded Purpose. For purposes of this Agreement, "Excluded Purpose" means making available any software-as-a-service, platform-as-a-service, infrastructure-as-a-service or other similar online service that competes with Confluent products or services that provide the Software. Moreover, this is not the first company restricting implementation of their intellectual property by other providers in a SaaS context. For example, RedisLabs recently moved specific modules to the Commons Clause license, while MongoDB released their product under the Server Side Public License. When asked why they are making these changes to their licensing, Neha Narkhede, Co-founder and CTO of Confluent, responds that "this is a move to let us continue investing heavily in code that we distribute for free, while sustaining a healthy business that funds our investment", as also found in the frequently asked questions page. Nevertheless, while we see several companies making similar changes, there has also been a concern by several people in the community. For instance, Bryan Cantrill, chief technology officer at Joyent and well-known in the open-source community, looked into this recent shift by these companies, and comes to the conclusion that "the licenses aren’t going to address the underlying problem". In his article he explains that, among other things, restricting these pieces is more likely to hurt open-source community than to help them, as the cloud providers will just create their own implementations of the restricted parts, not contributing back to the project at all. Another person of interest here who has like-minded ideas is Dor Loar, founder at ScyllaDB, who states this will not just impact the large cloud vendors, but smaller open-source focused companies as well. Another class of companies who will be hurt by this licensing trend will be smaller as-a-service vendors that provide MongoDB/Elastic/Kafka/etc. Despite their contributions back to the OSS, these smaller companies will be hampered by the more restrictive licenses, which will keep them from running the very technologies they've aided. Currently, the impact of the changes made by Confluent is still relatively small, as the licensing status of the components in the previous versions will not change. Consequently, this means providers can continue to use these while planning their response to the new licensing terms.